Find an egg-filed Easter menu with special offerings from Goa Taco, Sus Arepas, Cena Vegan, Ma La La, Low Key Burritos and Baroo. Part of a new-ish development called ROW DTLA, what I really love about the location of Smorgasburg is that it has ample parking! Not only that, but it's 2 hours free, which both combined is as rare and beautiful as a unicorn, especially when it comes to most of Downtown LA! On top of that, the vendor selection is great, with a ton of different eateries to try out that are unique. I love the fact that they're all pretty small businesses with out-of-the-box, yet quality concepts. At the same time, it's not overwhelming, which is actually a relief so you don't feel foodie FOMO at the end of your visit. There's still enough vendors that leave you wanting to come back again, which is always great. My biggest tip would be to come with a big group so you can all get different items to share, and try a little bit of a lot of different things and see what you like! Wish there was a little more shade, but they do have some tables with umbrellas, and has a mister when I went. Highly recommend for a fun day in DTLA! I have to say, I love the space where Row is (the venue). The abandoned American Apparel buildings give an air of Resident Evil: Apocalypse - which is awesome - but yes, the decrepit facades definitely add an interesting element and artsy feel for the environment of the housed event. I expected it to be bigger, more food vendors and whatnot, but that was before I understood that some of them are rotating. There were a lot of places I wanted to try, but of course my eyes are bigger than my stomach, so I only sampled Calo, Mama Musubi, Donut Friend (which I've had before), and an Angel City brew from the MicheMobile (which I thought was cool). Their beer garden is fun but I think they should expand it. People want more shade when they drink and eat - especially during the hot days - and there aren't enough tables. Overall it was a good event and very chill. I happened to have attended on barbecue day - my favorite - and they apparently have themes for different dates: ice cream, BBQ, pies, etc. ; so make sure to follow them on Instagram and stay updated. A very cool foodie paradise experience! Didn't know this was from NYC, and it's a great concept pulling together local businesses in one place. A lot of the vendors here are very organic ,artisanal, and that kind of food. I saw all types/variations of basics like burgers, mac n cheese, ice cream, and more. If you're a foodie, definitely a good spot to eat and try some new things! A very fun way to spend a Sunday. Be sure to attend with an empty stomach and try a variety of dishes. They also have a small beer/alcohol garden. 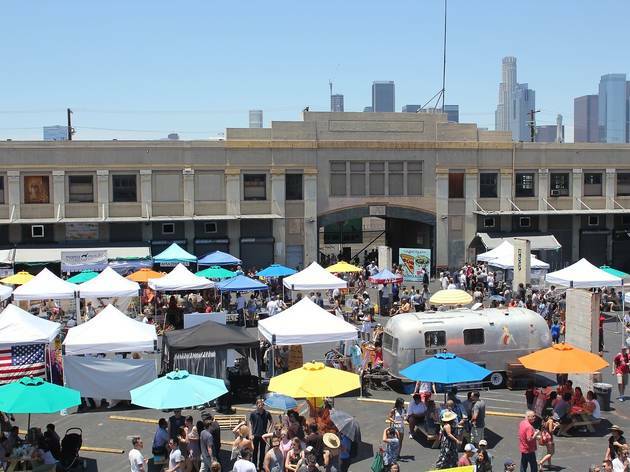 Follow them on Instagram (@smorgasburgla) to see what vendors will be in attendance that week. There is free two hour parking in the garage. A great way to spend a Sunday afternoon - regardless of if you're a tourist or local. 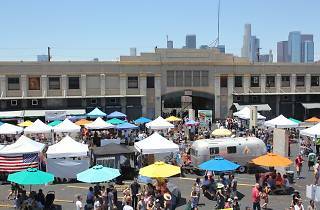 Smorgasburg has something for every taste and is a fun place to visit with friends or family. When I stopped by this September, the lot was full of familiar LA vendors - Donut Friend, Gorilla Tacos, & Amazebowls to name a few. My group and I tried a delicious scallion pancake dish, an acai bowl, and a Popdup beverage (that was very beautiful but a bit too syrup-y for our taste). If you go with a group, I suggest sharing a few different dishes so you can taste lots of what Smorgasburg has to offer without emptying your wallet. Also, note that seating is sometimes tough to come by once you've finally waited out the long line to get your dish. If you're there with a few people, it might be a good idea to send one to scope out a table while others wait in line. DO IT. How could any one have anything bad to say about Smorgasburg?! There is such a variety of food and vendors that there is something for everyone! Plus there is a whole row of thrifting and shopping to fill your flea market needs! Don't miss out, who knows how long it will be around!